The Justice and Development Party (AK Party) on Sunday applied to the Supreme Election Council (YSK) for a full recount of votes cast in 38 districts of Istanbul in the March 31 local elections. "Except for Büyükçekmece, we have applied to the YSK for all votes in Istanbul to be recounted. In Büyükçekmece, we have demanded the annulation of the election," Ali Ihsan Yavuz, deputy chairman of the party, said Sunday, as a recount of votes that were previously deemed invalid was continuing in several Istanbul districts. "We chose the path to eliminate numerical mistakes. But it's not over," Yavuz told reporters earlier in the day. Yavuz said the AK Party had already appealed for a full recount in the Istanbul district of Beyoğlu, one of 39 voting districts in Turkey's largest city. 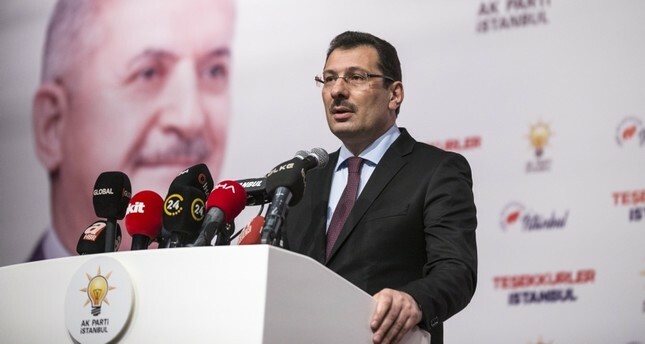 Yavuz also said the main opposition Republican People's Party (CHP) candidate Ekrem Imamoğlu's lead over AK Party candidate Binali Yıldırım has narrowed to 16,442 votes as a result of the partial recount.